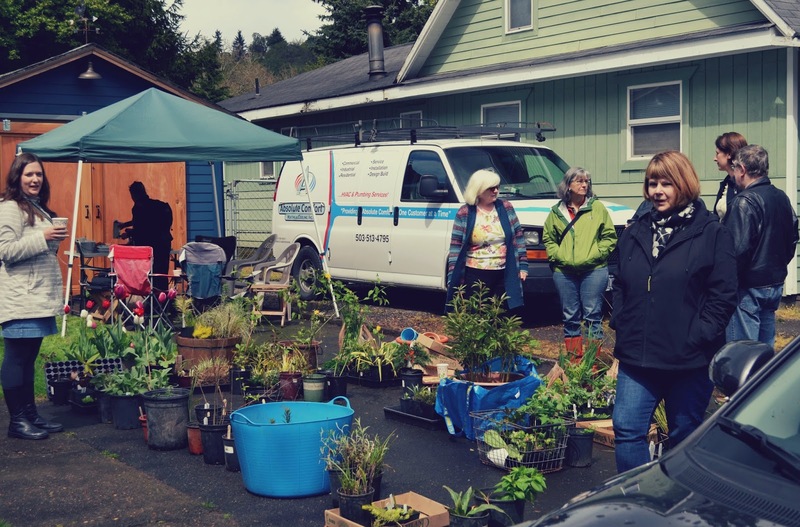 Rumbling thunder couldn't keep the hardy, Portland area, garden bloggers, from getting together to share extra plants. Rain threatened, but held off for all to enjoy a 'plant' social. Yours truly hosted the semi-annual event and was pleased as punch that we had such a large turnout for this spring event. We even had representation from our Seattle area blogging friends. Plants lined my driveway and there were so many that it was hard to walk around. Soon though, they began to get distributed while happy conversations filled the air. We kept warm with hot coffee and tea and some braved my water logged yard for a look around. It's always fun to catch up with members of this delightful group. I am amazed at their gardening wisdom and always appreciate their expert advice. Heck, getting some new plants for free is a pretty sweet bonus. Do you get together with garden bloggers in your area? We are so SO lucky to have such an excellent group. Can you even imagine? Two get togethers where we all bring plants and exchange them? Pretty much heaven. I came home with an amazing amount of cool plants. Thank you Jenni and all! What a fun time. Sorry I couldn't come down this time as I'd love to see your garden and all the fun PDX bloggers but I work on Sundays. Sounds like it was a blast! Happy new plants all! So is it a case on bring one plant get one? I had to enlarge the photos so I could get a better look at all the goodies and recognizable faces. What a wonderful event. Nice of you to host this Jennifer. The little town of Nemo hosted 40 gardeners for our annual garden classes. This year we had a great speaker about how to prune our trees after the blizzard. After the speakers we had a plant swap. The local gardeners always bring slips of houseplants for our students. The kids are always so proud of their finds. BK - This sounds like an awesome event! Hi. I'm a new follower by e-mail. Can you comment here as to which other bloggers are in the Portland area? I can't quite remember how I happened upon yours, but I'd like to follow a couple others as well. I see your list of "Pacific NW Bloggers" to the right side of the page, but don't know which ones are gardening in the Portland/Vancouver area. Thanks in advance. 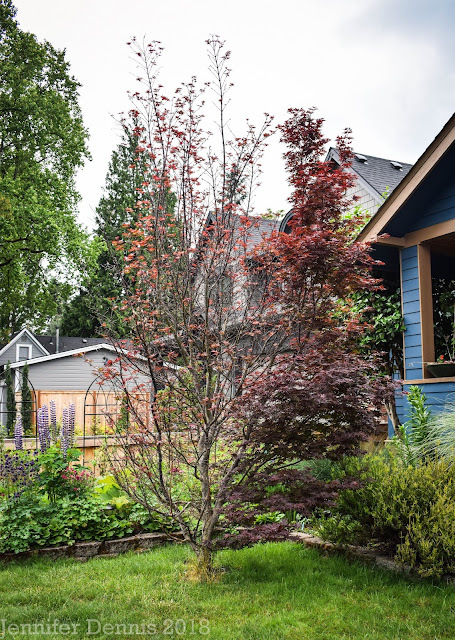 I recommend following Danger Garden, Rhone Street, The Lents Gardener, Gardening with Grace, MulchMaid, Whatsit Garden, Gravy Lessons, Sprig to Twig, Just a Girl With A Hammer, ChickaDee Gardens,The Creative Flux and Amateur Bot-Ann-ist. It looks like such a fun gathering. Loree invited me but I couldn't make it either. Thanks so much for your hospitality, and to everyone for the excellent plants and companionship. There are few bloggers in my area, although many more over on Vancouver Island where I know some of them meet up. I think this is a lovely idea. Hello Jennifer, t hank you so much for hosting! It was so great to finally meet you...looking forward to many more swaps and garden fun!